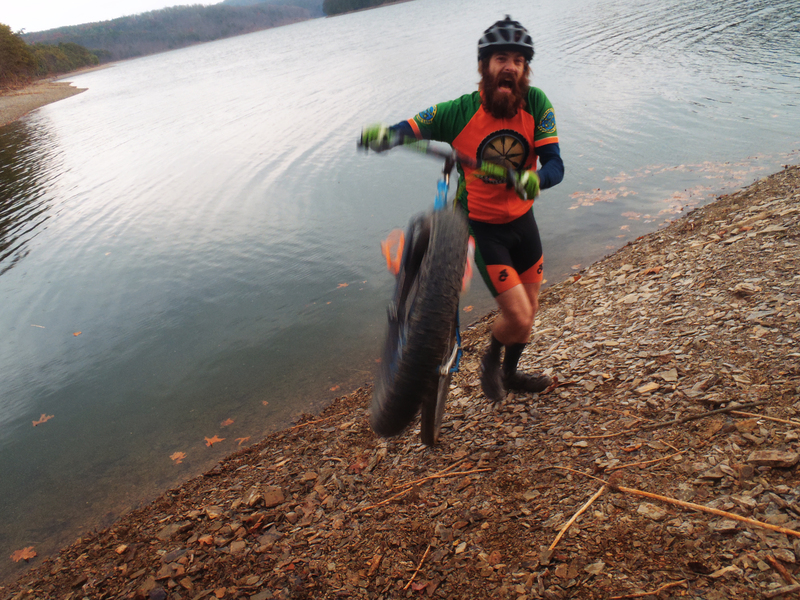 A fat-tire’d, mud-slingin’, rock-skippin’ Sunday. 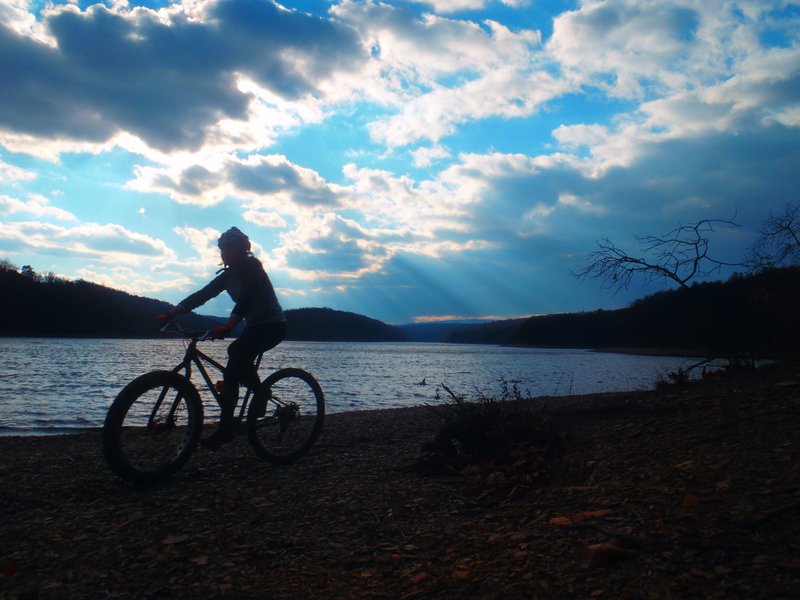 Lately, the world of mountain biking for those of us living in the vicinity of Raystown Lake has changed a bit. 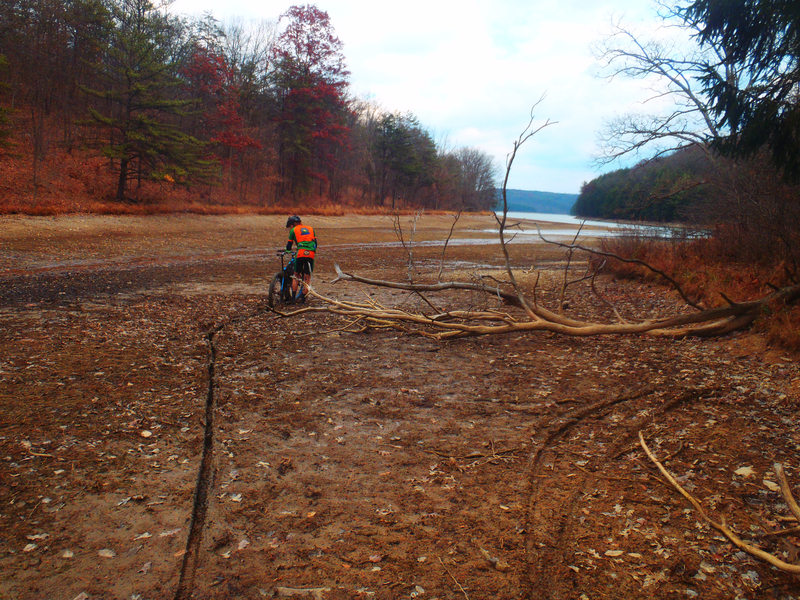 This fall, the Army Corps of Engineers is drawing down the level of the lake more than twice the usual seasonal 2-3 feet in order to perform shoreline maintenance. 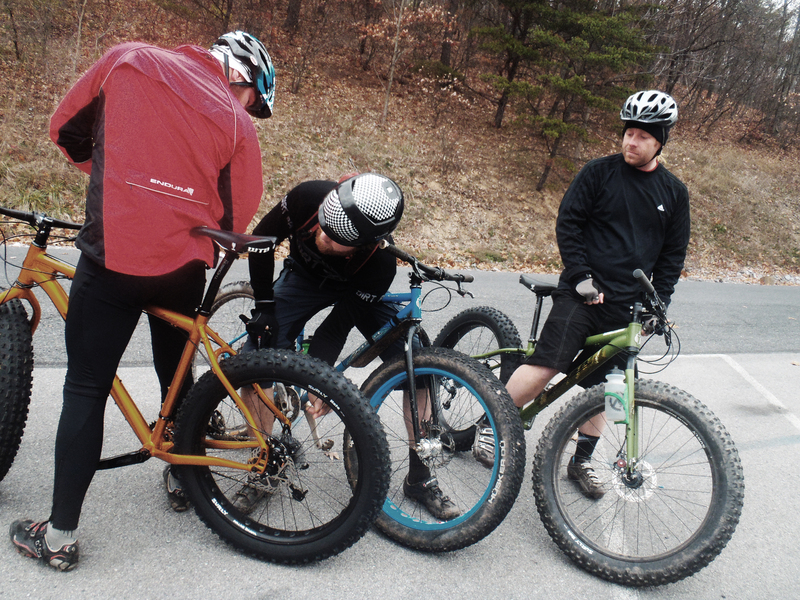 For those of us with fat tires and a spirit for exploration, this means some primo off-the-beaten-path riding opportunities. Last Sunday morning, a group of us met outside the shop under gray, rain-threatening skies. 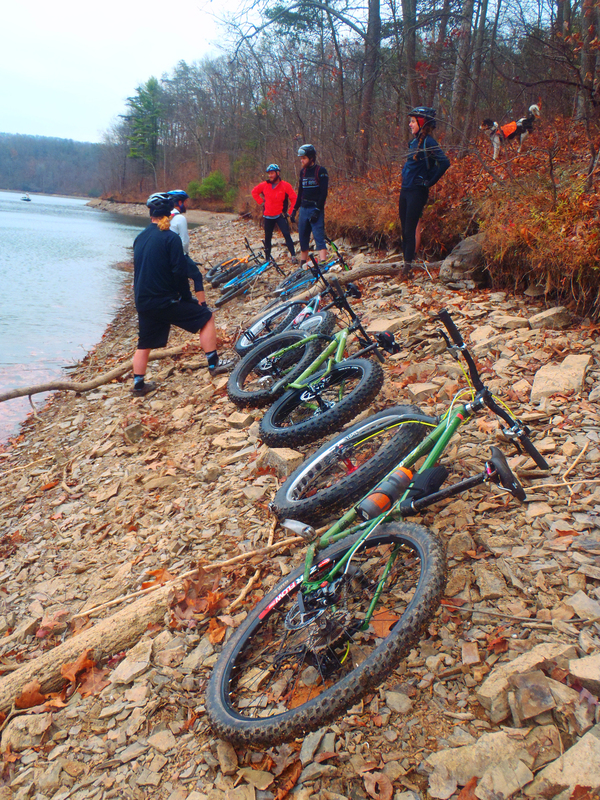 The plan was to load up Jeff’s pontoon (or, more accurately, tri-toon) boat with bikes, beer, and grub, and motor along the shoreline looking for the best riding spots. 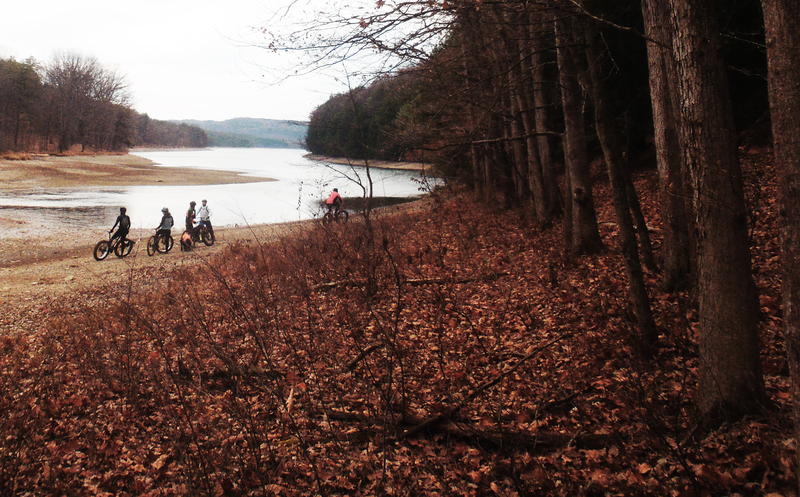 High winds and mechanical troubles thwarted the boat plan, but we were all quick to make do, and instead we simply hopped on bikes and rode south from Snyders Run boat launch. 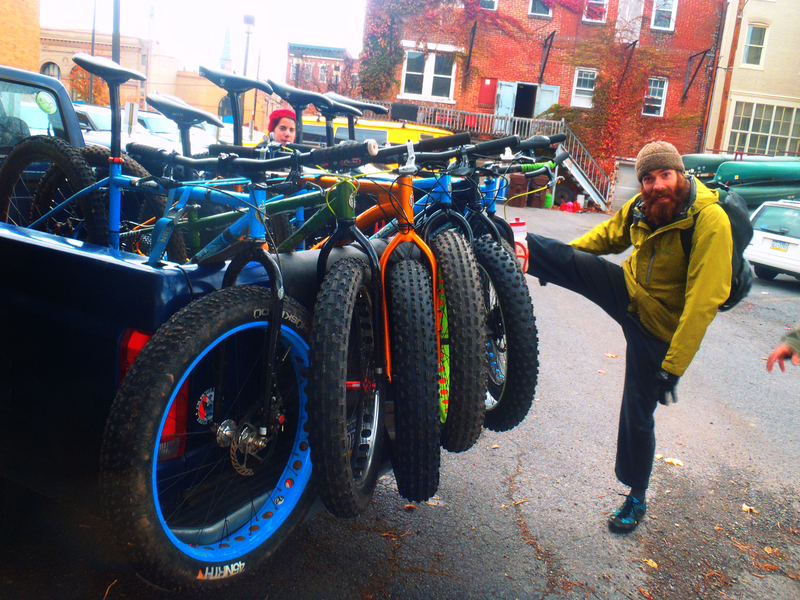 Fat-bikes and fun attitudes are all ready to go. We had chosen a fantastic spot. 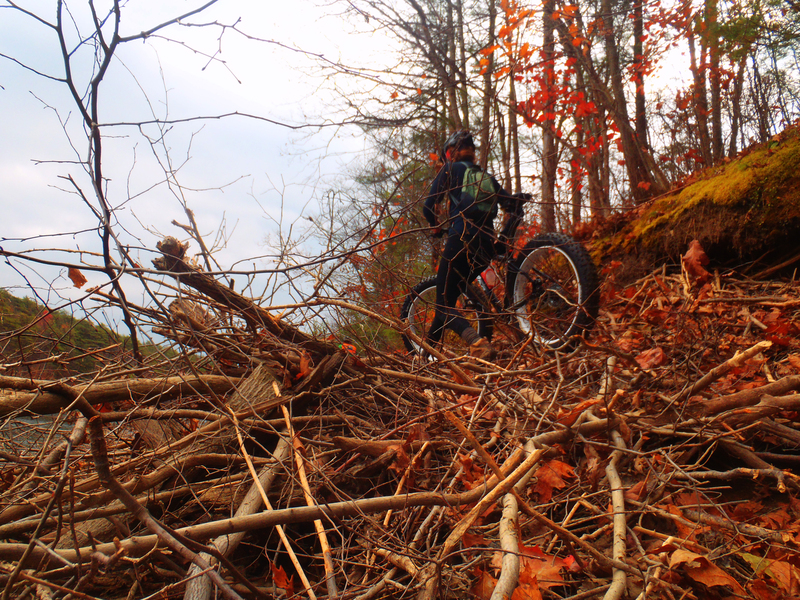 Aside from a few trees, beaver lodges, and cliffs that required some hiking, lifting, and careful footwork, the shoreline was mostly clear, at least compared to some of the other sections we had scoped out on previous rides. 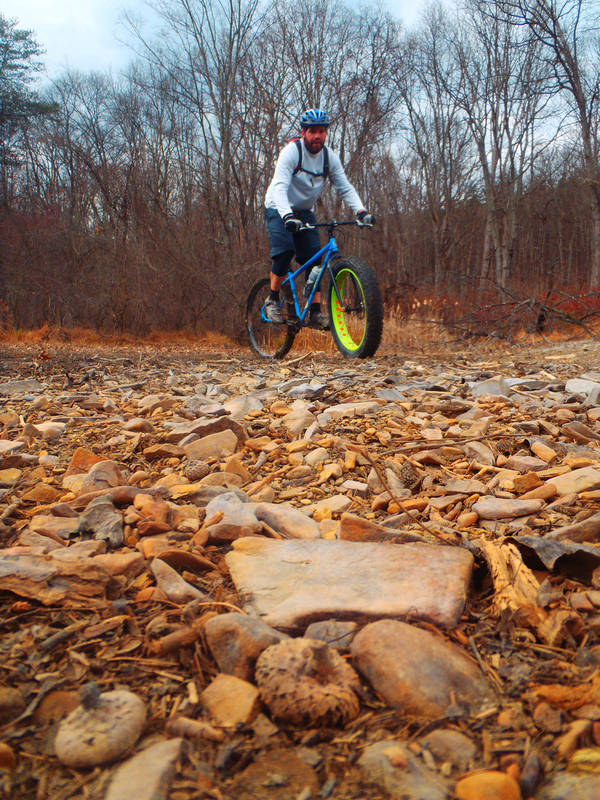 One of the hike-a-bike portions. Beaver lodges offer unique obstacles. 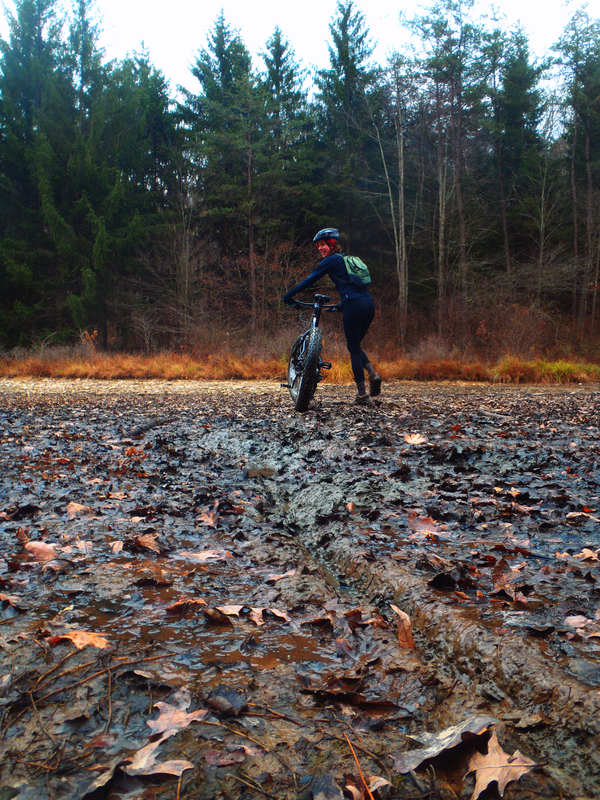 The muddy inlets, however, were challenges themselves. 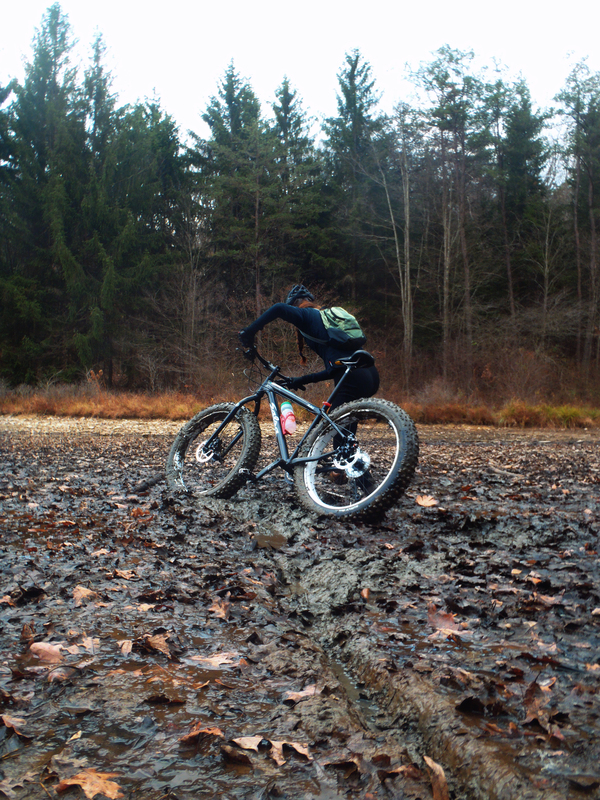 Not too far into the ride, I was motoring through the thick, deep sludge when my front tire slammed into a buried root, stopping my bike short and throwing me to the ground. Both myself and my bike now mud-covered, I picked myself up and limped to more solid ground, my knee throbbing from whatever hard object it had hit when I hit the ground. A few minutes and one Dales Pale Ale later, I was ready to get back on the bike and continue the journey. But that wasn’t the last close encounter with mud we’d have. 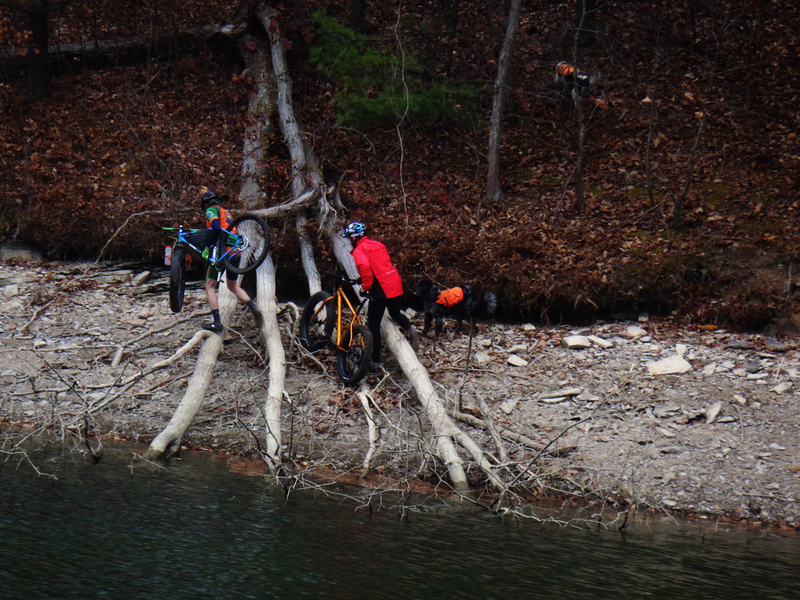 Several other inlets were even harder to get through, and even with fat tires and desperate pedaling, a few of us got stuck in the mud, and all of us and our bikes ended up more than a little bit dirty. But there were also plenty of stretches of completely unobstructed shoreline, where we could ride along leisurely and look out across the vast expanse of the lake. The waters that are normally bustling with boat traffic during the summer months are now nearly empty, calm and still aside from the whitecaps whipped up by the wind. 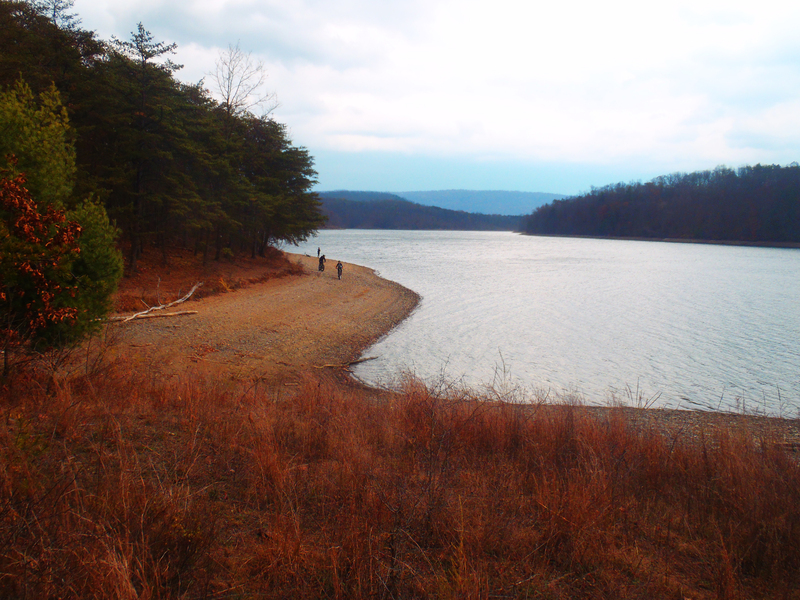 The last of the leaves, colors now muted, hung on trees on the opposite shore. 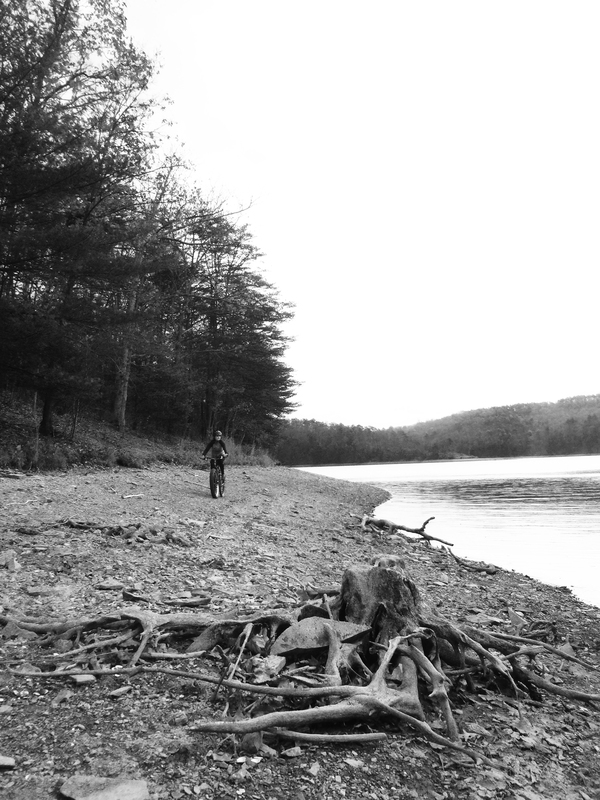 Up ahead, the ghostly skeletons of tree stumps normally drowned in the lake stick up from the rocks. 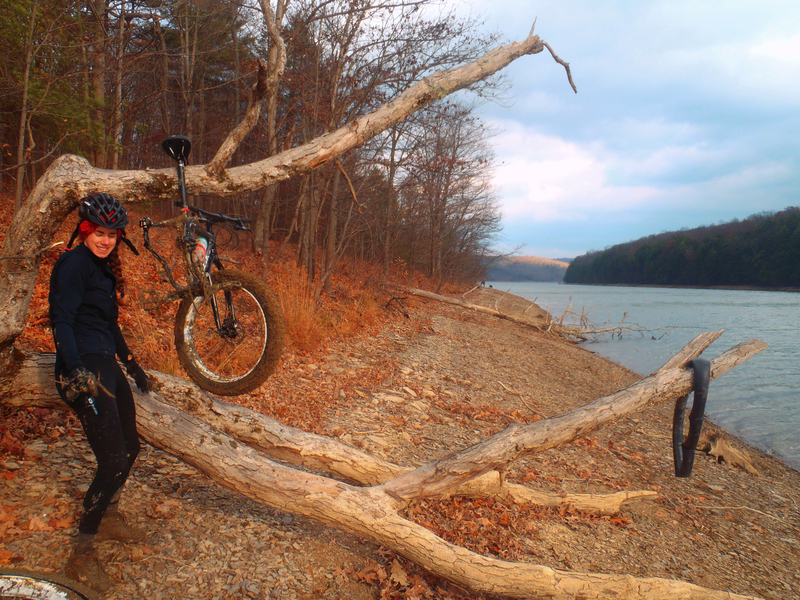 If I didn’t know any better, I’d think I was riding on a beach in Alaska or somewhere equally remote. 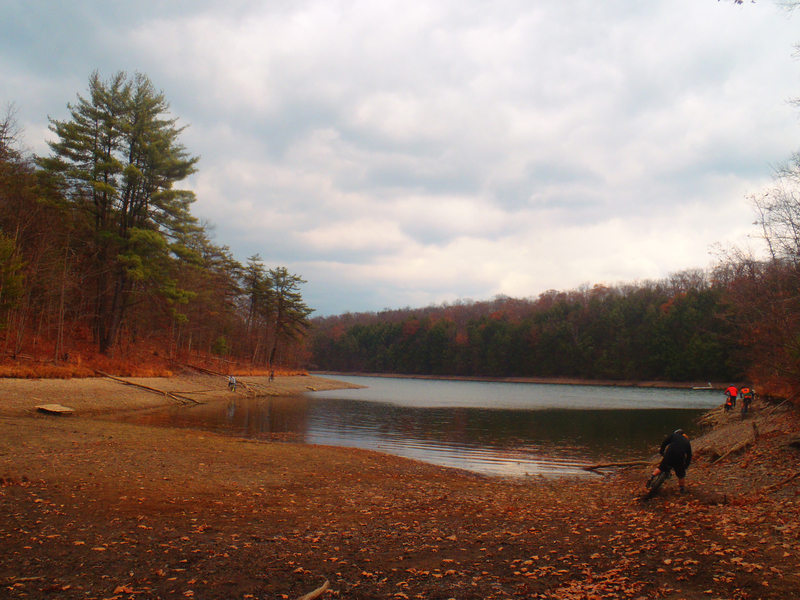 But instead, this surreal landscape is only moments away from where we live. 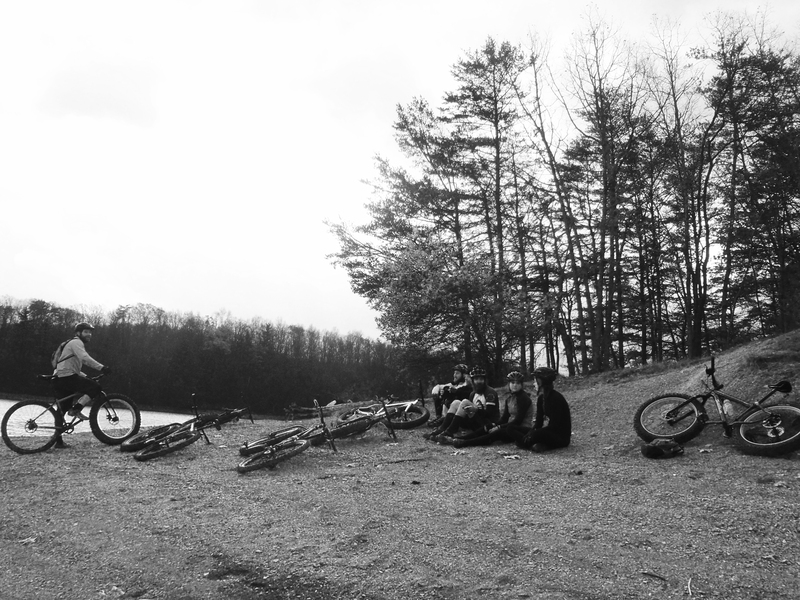 A few flat tires along the way provided opportunities to sit down, relax, chat, and otherwise simply enjoy the day, which was turning out to be a beautiful one despite the mornings threat of rain. One particular beach proved to be the home of plenty of skippable stones, which some of us took full advantage of while we waited for Jaylin to finish patching his punctured tube. Evan teaches Jaylin how to patch a tube. Jake’s just bein’ Jake. 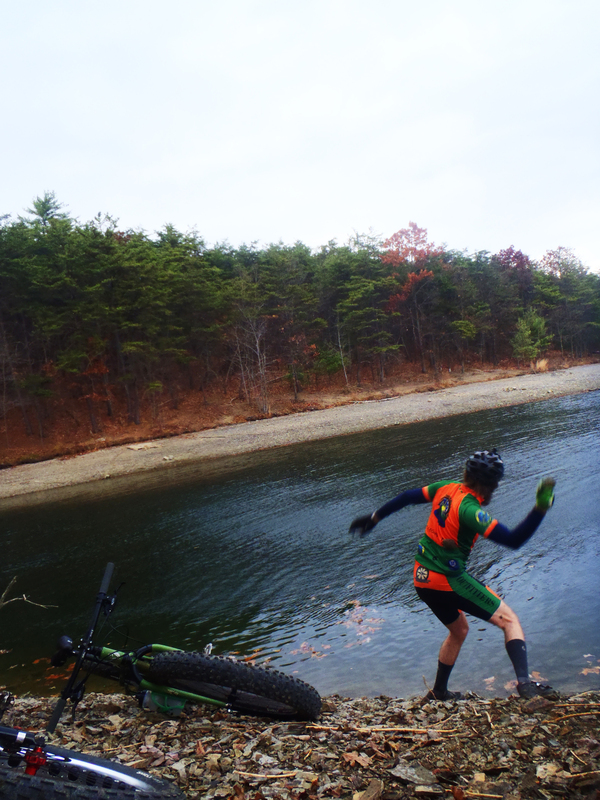 Jake demonstrates his stone-skipping skills. 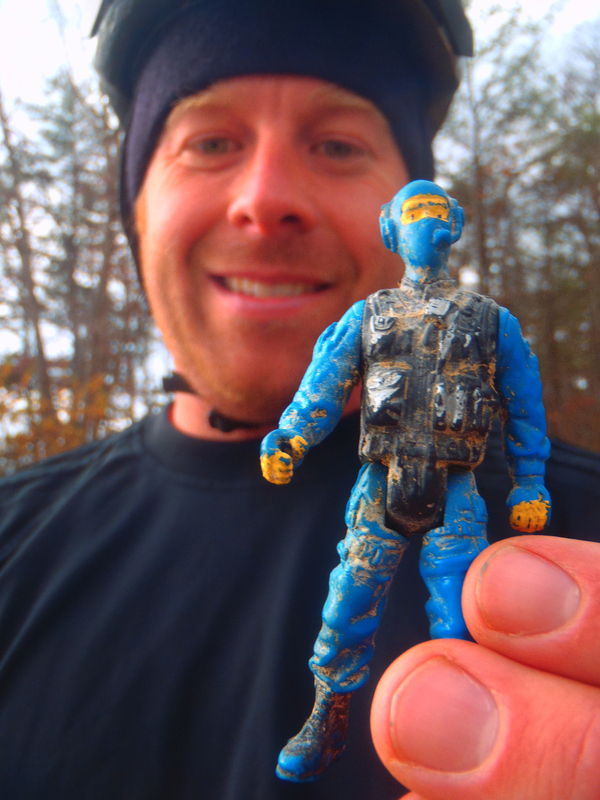 Jeff finds “lake treasure” and a new little friend. 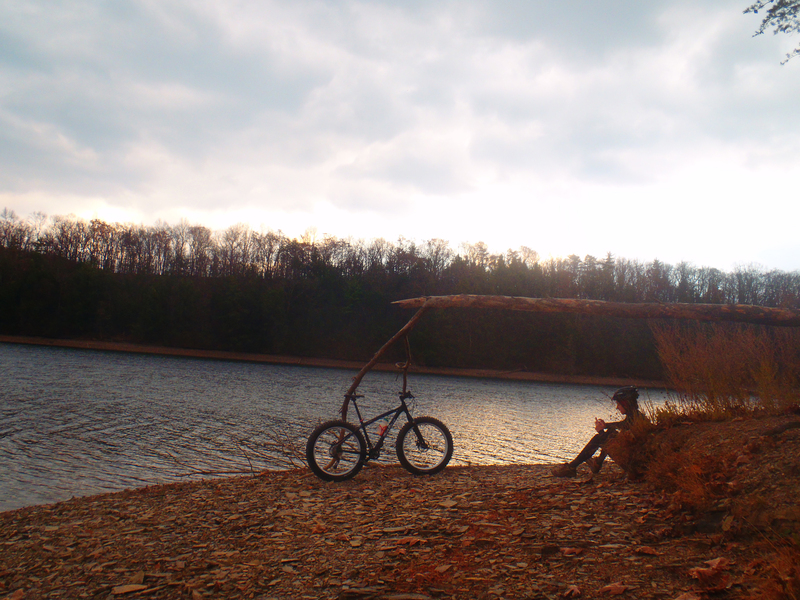 Quiet moment with a bike. Not-so-quiet moment with a bike. I happened to be sitting in just the right place, and this looked like a cool shot. At some point, as we grew more and more hungry and further and further away from the vehicles, we had to make a decision. Turn around and head back to the boat launch, or continue on and ride all the way back to our house along the shore, and then ride back to the boat launch to pick up the vehicles via roads. After some deliberating, we chose the former, and retraced our steps as the sun began to sink in the sky. The pork tenderloins that we grilled in the parking lot were a delight to our hungry stomachs, and the laughs we all shared were a delight to our souls. The sun had nearly set and the air was significantly colder by the time we piled back into vehicles and drove back to town. 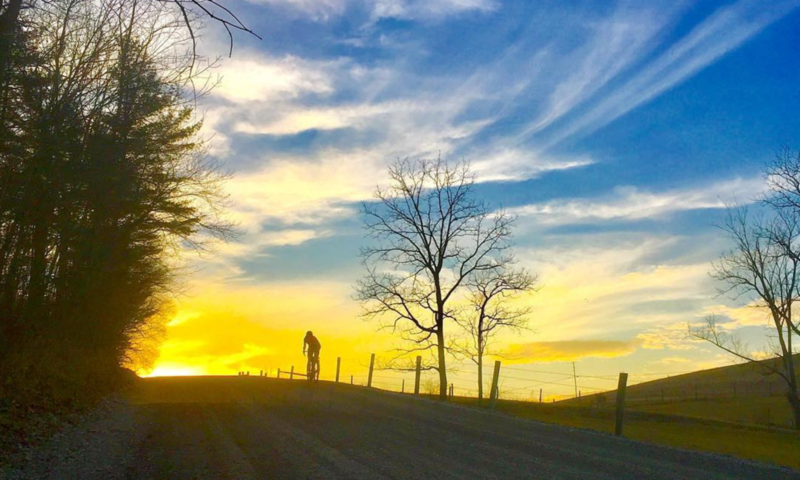 It was another absolutely wonderful Sunday on two wheels. Spare tubes and patch kits are definitely recommended. Next PostNext A couple hours on Trough Creek.